↑ "Harry Styles born in Redditch - confirmed". Redditch Standard. 3 January 2014. สืบค้นเมื่อ 2 February 2014. ↑ "Soft rock with an edge". The Straits Times. 17 May 2017. สืบค้นเมื่อ 25 June 2017. ↑ Jepson, Louisa (2013). Harry Styles - Every Piece of Me. Simon & Schuster. ISBN 9781471128479. สืบค้นเมื่อ 16 October 2013. ↑ Oliver, Sarah (2013). Harry Styles and Niall Horan: the Biography - Choose Your Favourite Member. John Blake. ISBN 1782193723. สืบค้นเมื่อ 20 September 2013. ↑ Parker, T.K. (2012). What Do You Know About Harry Styles? The Unauthorized Trivia Quiz Game Book. What Do You Know Publications. ISBN 1476941165. สืบค้นเมื่อ 20 September 2013. ↑ McNary, Dave (2016-03-11). "Harry Styles, Fionn Whitehead to Star in Christopher Nolan WW2 Action-Thriller 'Dunkirk'" (in อังกฤษ). สืบค้นเมื่อ 2016-08-28. ↑ 7.0 7.1 7.2 7.3 "Harry Styles | Full Official Chart History". Official Charts Company. สืบค้นเมื่อ 15 April 2017. 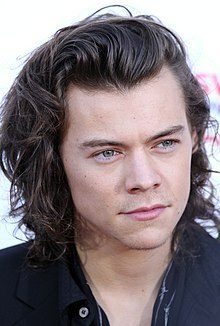 For all except noted: "australian-charts.com – Discography Harry Styles". Hung Medien. สืบค้นเมื่อ 19 April 2017. For "Sweet Creature": "ARIA Australian Top 50 Singles". Australian Recording Industry Association. 29 May 2017. สืบค้นเมื่อ 27 May 2017. ↑ "On The Charts: May 22, 2017". FYIMusicNews. สืบค้นเมื่อ May 23, 2017. ↑ 10.0 10.1 10.2 "lescharts.com – Discographie Harry Styles". Hung Medien. สืบค้นเมื่อ 19 May 2017. ↑ 11.0 11.1 11.2 11.3 "irish-charts.com – Discography Harry Styles". Hung Medien. สืบค้นเมื่อ 19 April 2017. ↑ 12.0 12.1 12.2 "italiancharts.com – Discography Harry Styles". Hung Medien. สืบค้นเมื่อ 19 April 2017. ↑ 13.0 13.1 13.2 "charts.org.nz – Discography Harry Styles". Hung Medien. สืบค้นเมื่อ 19 April 2017. ↑ 14.0 14.1 14.2 "swedishcharts.com – Discography Harry Styles". Hung Medien. สืบค้นเมื่อ 19 April 2017. ↑ 15.0 15.1 "hitparade.ch – Discographie Harry Styles". Hung Medien. สืบค้นเมื่อ 19 April 2017. ↑ Caulfield, Keith (21 May 2017). "Harry Styles Debuts at No. 1 on Billboard 200 Albums Chart". Billboard. สืบค้นเมื่อ 22 May 2017. ↑ "NZ Top 40 Albums Chart". Recorded Music NZ. 22 May 2017. สืบค้นเมื่อ 19 May 2017. ↑ "Sverigetopplistan - Sveriges Officiella Topplista". Sverigetopplistan. สืบค้นเมื่อ 20 May 2017. Click on "Veckans albumlista". ↑ "ARIA Australian Top 50 Albums". Australian Recording Industry Association. 22 May 2017. สืบค้นเมื่อ 20 May 2017. ↑ 23.0 23.1 23.2 "Harry Styles – Chart History: Canadian Hot 100". Billboard. สืบค้นเมื่อ 19 April 2017. ↑ 24.0 24.1 "Harry Styles – Chart History: The Hot 100". Billboard. สืบค้นเมื่อ 19 April 2017. ↑ "ARIA Australian Top 50 Singles". Australian Recording Industry Association. 22 May 2017. สืบค้นเมื่อ 20 May 2017. ↑ "Canadian certifications – Harry Styles". Music Canada. สืบค้นเมื่อ 7 June 2017. ↑ "New Zealand single certifications – Harry Styles – Sign of the Times". Recorded Music NZ. สืบค้นเมื่อ 26 May 2017. ↑ "Hear Harry Styles' Sweeping New Folk Song 'Sweet Creature'". Rolling Stone. 2 May 2017. สืบค้นเมื่อ 2 May 2017. ↑ 33.0 33.1 "IRMA – Irish Charts". Irish Recorded Music Association. สืบค้นเมื่อ 20 May 2017. ↑ 35.0 35.1 "NZ Top 40 Singles Chart". Recorded Music NZ. 22 May 2017. สืบค้นเมื่อ 19 May 2017. ↑ "Sverigetopplistan - Sveriges Officiella Topplista". Sverigetopplistan. สืบค้นเมื่อ 12 May 2017. ↑ "Swedish Heatseekers Chart - 19 May 2017". สืบค้นเมื่อ 19 May 2017. ↑ "Chart Search for Harry Styles (Bubbling Under R&B/Hip-Hop Singles)". Billboard. สืบค้นเมื่อ 23 May 2017. ↑ Lipshutz, Jason (30 June 2014). "Ariana Grande's 'My Everything' Track List: The Weeknd, Big Sean, A$AP Ferg & More". Billboard. สืบค้นเมื่อ 8 November 2014. ↑ "Gavin DeGraw to Release "Best Of" Album October 21, Includes Song Co-Written by Harry Styles". ABC News Radio. 14 August 2014. สืบค้นเมื่อ 20 August 2014. ↑ David Renshaw (16 December 2014). "NME News Kasabian, Royal Blood, Jamie T lead nominations for NME Awards 2015 with Austin, Texas - voting open - NME.COM". NME.COM. ↑ "The Idler - Bad Grammar Awards 2015: Amazon win (or is that wins?)". Idler.co.uk. สืบค้นเมื่อ 17 May 2017. หน้านี้แก้ไขล่าสุดเมื่อวันที่ 28 สิงหาคม 2560 เวลา 02:06 น.